Late last year we held an event that explored Glasgow’s medical, legal, criminal and social histories. In particular, we explored the work of the city’s police surgeon during the 1870s, making extensive use of our William Macewen archive collection. The event was part of our on-going collaboration with Dr Cheryl McGeachan of the University of Glasgow, and her emerging research project ‘A Distinctly Scottish Surgeon? Uncovering Police Surgery in 19th Century Scotland’, which has just been awarded a Carnegie Research Incentive Grant. The event included short papers on current research interests in this area, including Jeff Meek’s ‘From Tardieu to Glaister: Police Surgeons and the Deviant Body, 1885 – 1930’ and Douglas Small’s ‘Cream and Cocaine: Crime, Detection, and Cocaine Habits in the 1890s’. Both papers provided specific background into the kind of cases attended to by the police surgeon: bodily assault, including sexual assault, and drug / substance abuse (including alcohol, opium, and laudanum). 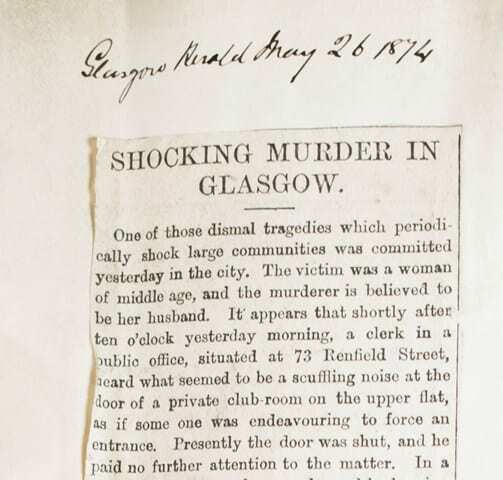 Other cases highlighted by the archive material on display during the event included murder and suicide cases. The archive material, drawn from the Macewen collection, included his Private Journal of Surgical Cases (1872 – 1875), scrapbooks containing newspaper cuttings of cases he attended as police surgeon, and correspondence relating to cases. We also made use of the early-career articles he wrote for Glasgow Medical Journal that drew significantly upon his police surgeon case work. This material presented a rich snapshot of crime in the city during the 1870s, often linking these grim and violent cases to Macewen’s early experimental and ground-breaking medical and surgical breakthroughs. 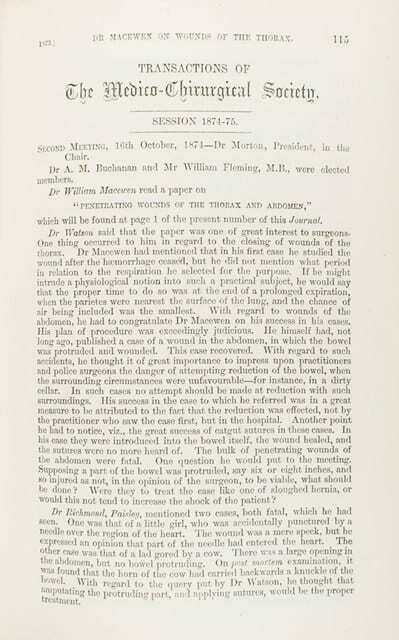 For example, Macewen’s paper to the Medico-Chirurgical Society of Glasgow, 16th October 1874, ‘Penetrating wounds of the thorax and abdomen’, draws most notably on a case of stabbing in Ropework Lane. 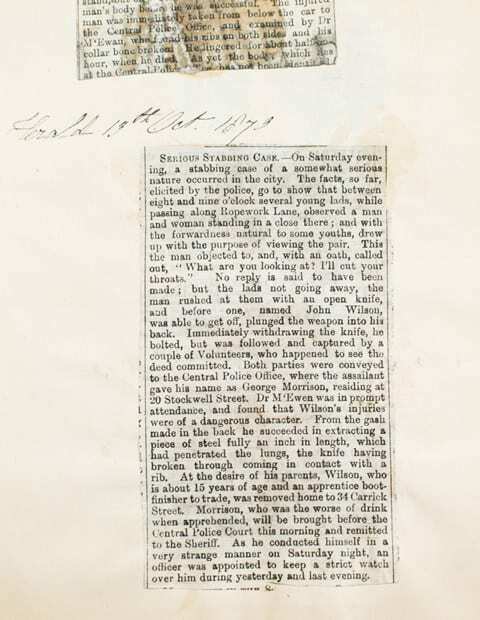 The newspaper cuttings tell us the almost mundane details of the case: two young lads disturbed a man and women in a close off the Lane, the man (who was ‘the worse of drink’) threatened them and then rushed them with an open pen-knife, stabbing one of the lads in the back. The blade of the knife penetrated the lung but was also broken from contact with the ribs, leaving a fragment of the blade in the lung. Macewen’s private journal (and the published paper) detail the bold approach to lung surgery required to remove the fragment, while making a strong stand against the perceived surgical wisdom about avoiding operating on the lung. 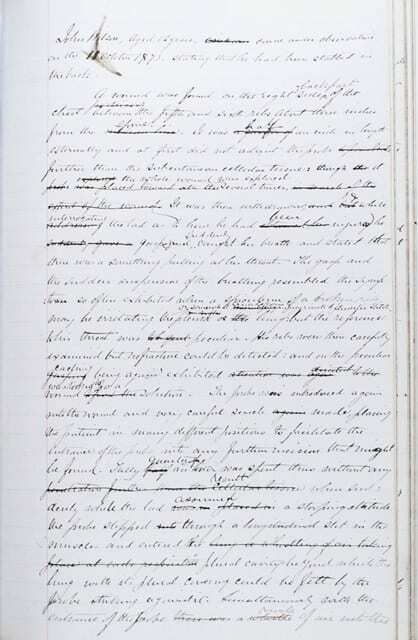 The success of this bold procedure, also carried out by strictly adhering to recently developed antiseptic principles, drew a complimentary correspondence from Joseph Lister (also in the College’s archive collection). Showcasing these archive collections, and those held at the University of Glasgow, was an important part of the event, highlighting the range of research resources available to those with an interest in these themes. From our museum collection we showcased some medical and surgical equipment that would’ve been commonly used by a police surgeon in the 19th century. 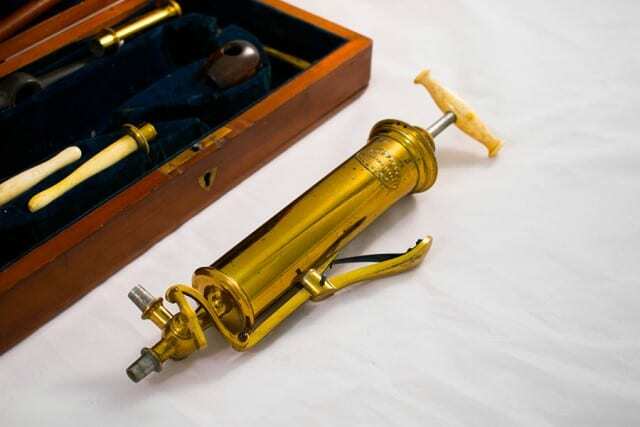 We picked out instruments that are regularly mentioned in Macewen’s work, for example a case of basic surgical instruments, including probes, and the very commonly used stomach pump. The event attendance highlighted the broad scope of interest in Glasgow’s criminal-medical history, with a fascinating range of backgrounds represented, from writers, dramatists, academics, surgeons, dentists, and ex-police officers. The workshop’s participatory element brought out all of these different perspectives and interests, with a view to identifying areas of collaboration or further research. Participants worked on a mapping activity, using archive reproductions of various police surgeon cases and reports, and matching these up to their locations on a 19th century map of the city. 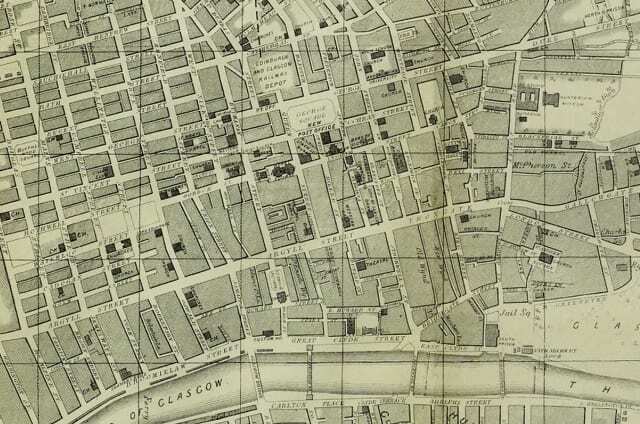 Combining the case material (surgical notes, clinical articles, newspaper cuttings) with the map of Glasgow really helped bring the 19th century city to life, and resulted in lots of discussion and questions, not just about the criminal / medical cases but also about the geography and social history of the city itself. 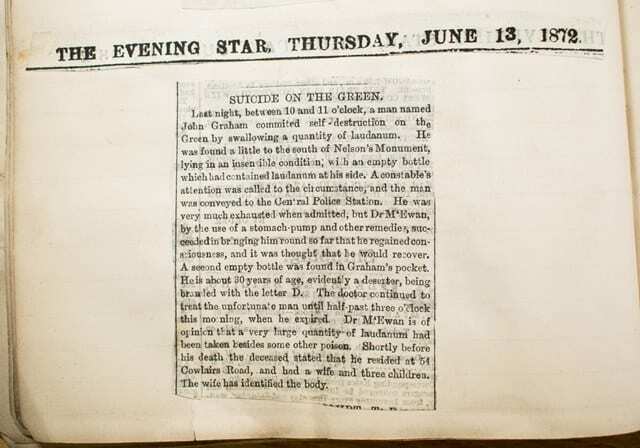 The police surgeon material that inspired the event was the subject of a feature in the Herald newspaper.